I'm thinking of starting a nail art diary where i will post a nail design of mine every few days (not sure exactly how often yet) and explain how the look was created if you want to replicate it. I am in no way a nail expert but i do like my designs, i love doing my nails and i love seeing other people's designs, so i thought i would share my own in a sort of diary! To create this look, what i did was firstly stick on french manicure false nails (i can't find the exact ones i used online but you can buy french mani nails anywhere - boots, superdrug, semi-chem etc.) I love false nails and although i fully know how bad they can be for your nails after repetitive use i still always use them. I do however take proper care of my nails when i do not have falsies on using cuticle oils and strengtheners etc. Glue the false nails on all fingers, except the two with the flowers. The flower nails i have used in these pictures are a complete cheat as i used four nails out of a set i bought from Matalan. 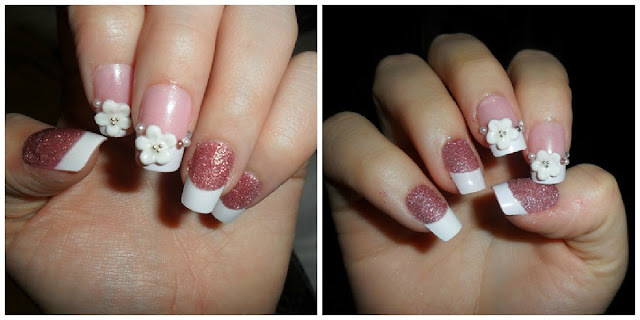 Previously however, doing the almost exact same design, i have used 3d flowers similar to the Matalan ones from ebay here and rhinestones like these ones here to create the same look just gluing them to the nail like the picture above with nail glue. This time i used the ones already made from Matalan because in the packet, despite it being very cheap, does not even contain enough nail sizes to cover both hands in the full design! I had to use up some of these nails somehow therefore, i just used them for this rather than doing them myself using ebay ones as i usually would. 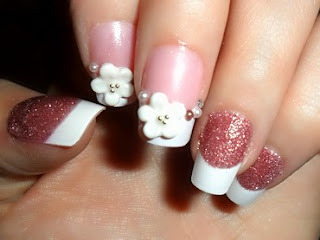 You can get different flowers and rhinestones etc from many different nail sites online. One of my favourite sites for nail art items is Sparklynails.co.uk, they are really cheap, give you useful tips, 'how to' videos and they have a great range of products! Anyway, to get the glitter effect on the rest of the nails i used Nailene Perfect Tips Polish Guides - here to prevent glitter from getting on the already french tips. To do this, basically just place the tip guide so that it's bottom curve matches up the the bottom curve of the tip already on the nail. Alternatively, if your nails are not already french manicured you can use the tip guides to paint your own tips, wait until this dries, then place another tip guide at the bottom to protect the tip while glittering! Then get a piece of paper or an empty box to catch all the fall out glitter because this bit can get a bit messy! All you want to do is place your hand in the box or over the paper and paint a clear top-coat or base-coat to your nails avoiding the tip area which should be protected by the tip-guide. Then, while this coat is still wet, simply pour glitter all over the nail and repeat this to the remaining nails! I have used a pink glitter this time but i have done this look using silver and blue glitter too all of which i got from Sparklynails.co.uk - here. They do loads of different kinds of glitter but the type i have used in this particular look is called 'Rose Nail Art Glitter Dust'. Then using a top-coat i just put a quick layer over the glitter and roll the nail in the excess fall out for more coverage. Then when this all dries i just lightly pat the glitter and add another quick topcoat to seal it all in! Et voila! Nail look complete! Hope you like and i didn't ramble on too much! Would you like me to keep up Nail Diaries every so often? Thanks! I do my nails a lot too! Love doing them.